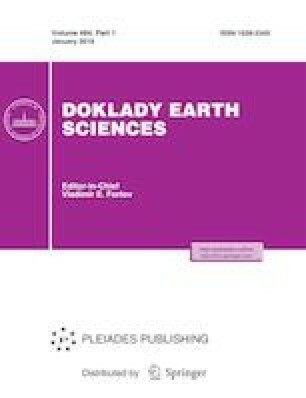 This paper reports on new data on δ34S and δ18O isotopy for trace and rare-earth elements of the Au deposits of the Glukharinskii ore cluster. The geochemical features indicate the reducing conditions of the ore deposition and the involvement of a magmatogenic fluid in ore-forming and point to the host rocks as possible sources of ore matter. On the basis of the isotopic data, it was determined that the ore-forming fluid has a mixed metamorphogenic–magmatogenic composition. The results suggest that the studied objects can be confidently considered as Au deposits related to granitoid intrusions. This work was supported by a grant from the Governor of Magadan Region for young scientists for 2017, the Presidium of the Russian Academy of Sciences (program no. 48), and the Russian Science Foundation (project no. 14-17-00170).